The past few weeks have been non stop as building starts, so Ed and I are taking a break and hopping across to Chile - Arica and Iquique to be exact, on the coast. Blogging will be resumed when we get back, especially answers to all those questions you have. Apart from the cows, pigs, goats and sheep that grazed on our land - and their poo was very welcome so we didn't mind them - there were the thorn bushes, which we did mind. They were everywhere, sporting vicious spikes that drove through the thickest soles and with the potential to cause punctured tyres on a regular basis. We needed to make a road so that we could drive to the area allocated for the first of the building, and to give access to delivery vehicles. 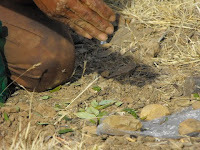 We cleared the stones from the 'road', using them to line the route and burned the thorn bushes that were in the way. The land around the building area also had to be cleared as a space for making adobe bricks. We decided that the first building would be a shed to house our tools and materials. As we had no experience of adobe, it seemed a good idea to use the shed as an experiment - to see what quality of bricks were produced from the dirt on the land and how sturdy the walls would be. We found a couple of guys, Philippe and Modesto, who agreed to make 100 adobe bricks for 65 bolivianos, the equivalent of approx. £6/6 Euros/$9 US. They reckoned they could make around 200 a day. We desperately needed a vehicle to get us back and forth to the land, some 20 minutes drive from Sucre. We wanted something that would take the rough and tough of climbing a steep and rocky hill every day, with the ability to transport workers and also give us enough space to sleep inside on camping trips. Todobien (everything ok), as I optimistically named it, was parked outside our apartment one day with a 'for sale' sign posted in the window. It was a minibus, or trufi as they are known here, with 4 wheel drive capability and in seemingly good nick considering it was nearly 20 years old. 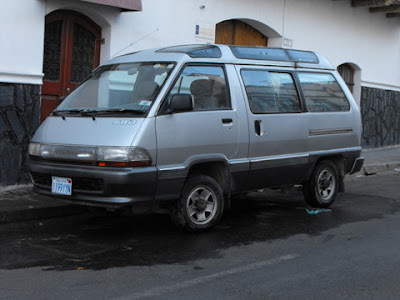 Like most vehicles in Bolivia, it had been shipped from Japan into Chile and converted to left-hand drive before being imported into the country. We took it for a test drive up to the land and it coped well with the rough terrain. The papers were signed and the money handed over. But Todobien was not todobien - the water pump packed up within a week, so we asked the mechanic who replaced it to check everything else was in order, as we were planning to drive it over the Andes to Chile. Our biggest concern was not having any water on the land, and the Uluchi family suggested inviting a water witch to help us find the best spot for a well. San Francisco was well known in the area for his ability to find water veins. San Francisco drank copious amounts of singani liquor, and smoked cigarettes, both of which were supposed to aid his powers. We assisted him by sipping singani too, and held lit cigarettes, even if we didn't smoke. 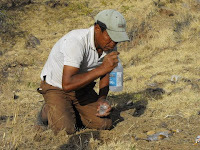 He muttered prayers to Pachamama into a bottle of pure alcohol, then sprinkled it on a square of plastic. 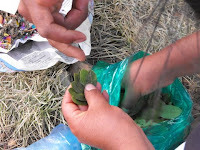 Coca leaves were dropped onto the wet plastic and their position and side up or side down indicated the presence of water and how many metres below ground. This process went on for several hours. 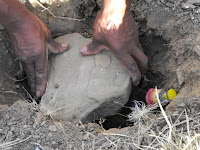 Eventually, the best spot was determined and was marked by burying the by now empty bottle of singani in a hole. In Bolivia it is considered bad luck to start work on building or renovating a house without having a Pachamama ceremony. Pachamama is the goddess of the earth, bringing fertility, abundance and good fortune to everyone. Although the former owners of the land live in Argentina, their brother and his family live close by and offered to help us in any way they could. 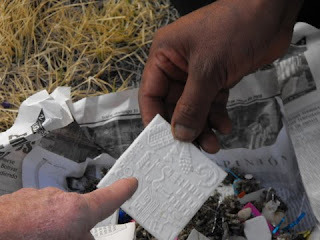 Alberto's wife Amparo purchased the items necessary for the ceremony - a piece of newspaper containing herbs, miniature dollar bills, tinsel and a polystyrene square with houses, crops, families, and all other eventualities. 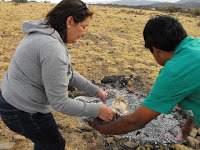 Coca leaves were added to the parcel which was carefully lifted over to a fire that had been lit on the land and tipped into the ashes. 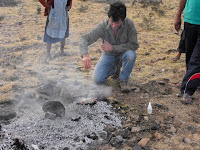 All of the Uluchi family, grandma, mum, dad, son and daughter poured small amounts of pure alcohol into the ashes as an offering, as did Ed. 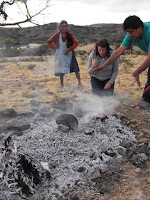 I then knelt in prayer to Pachama asking for her blessing on our project. Today was the 200th anniversary of Bolivia's call for independence from Spain - the first country in South America to agitate for independence and the last to gain it - in 1824. Since then the country has suffered territorial losses to Chile, Brazil and Uruguay, military coups, dictatorships, social unrest and terrible poverty for its indigenous population. 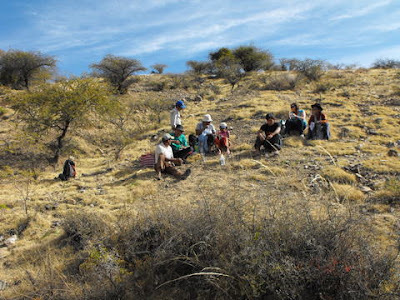 However, in January 2006 Evo Morales, was inaugurated as Bolivia's first indigenous President with a clear majority and a promise to help the poor. A self-confessed Marxist and friend of Chavez he vowed to seize unproductive land from the economic elite and return it to the indigenous population and to use revenues from the countries natural resources to create social programmes for the poor. Although most of the elite live in Santa Cruz in the east of the country, Sucre is a conservative city, proud of its role as judicial capital of Bolivia but campaigning to revert to its former position of being the seat of government, instead of the current location in La Paz. Sucre has consistently opposed Morales's reforms in favour of preserving the status quo and last year the city was host to an outburst of racism that was reported in the world's press. A number of indigenous people who were entering the city to see their beloved President on a scheduled appearance were seized by right wing vigilantes, and forced to kneel in front of the Casa de la Liberdad in the main plaza and apologize for coming to support Evo Morales. The President was forced to cancel his visit and it appears that the authorities in Sucre did little to condemn the incident. There have been two referendums since then, one a vote of confidence in Evo Morales as President, the second on the rewriting of the Constitution to incorporate Morales's reforms. On both occasions Morales won with a clear national majority. On both occasions the people of Sucre campaigned for a 'no' vote and voted no with a clear majority. Today, Evo Morales visited Sucre to celebrate Independence Day on the balcony of the Casa de la Liberdad. The local press talked of small but significant efforts at peace between the two sides and for a while Sucre enjoyed parading in the Plaza. Evo Morales (centre) with two bodyguards keeping their eye out for trouble and a military adviser. There were groups representing local indigenous communities, human and animal rights advocates and of course military bands strutting their stuff in their uniforms. Indigenous crowds who had come in from the countryside shouted 'Evo, Evo' and the city dwellers cheered the marching bands. Evo, his military advisers and his bodyguards clapped as the parades passed, local dignitaries sitting on the other side of the road were served canapes by waiters. Then the representatives of the Sucre government appeared on the balcony of the Prefecturo - the 'town hall'. They had been absent from the celebrations all morning, although the mayor Savina Quellar had apparently told Evo Morales to his face that he had only come to Sucre to provoke and divide. "This is not government, this is dictatorship". One of them started to chant "democracy yes, dictatorship no", it quickly spread to the others and then many in the crowd started hurling the usual insults calling Evo Morales a llama herder . Riot police started running around and regrouping, soldiers with tear gas guns stood at the ready. Suddenly two official cars reversed past us to the entrance to the Casa de la Liberdad and the President was whisked away. The government officials waved their arms to usher him on his way, their faces expressing disgust. Sucre had gritted its teeth for as long as it could, and with Evo Morales gone, was free to continue the celebrations in denial and defiance of the democratically elected leader of Bolivia.